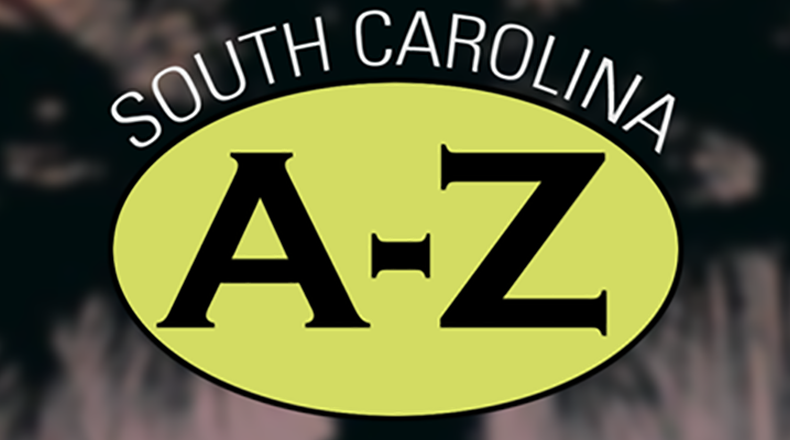 From Hilton Head to Caesars Head, and from the Lords Proprietors to Hootie and the Blowfish, historian Walter Edgar mines the riches of the South Carolina Encyclopedia to bring you South Carolina from A to Z. "C" is for Columbia Canal. Completed in 1824, the Columbia Canal—originally three miles long--was located on the east bank of the Congaree River, near the junction of the Broad and Saluda Rivers. It was one of several canals constructed by the state of South Carolina to improve transportation links between the upstate and Charleston. The Confederate government used the canal to run powder works. While its usefulness as a transportation source declined (because of the railroad), the canal had excellent prospects for generating power. "C" is for Columbia Army Air Base. In 1940 Columbia Army Air Base began as one of 250 sites where federal funds would be used to construct an airfield. It was originally designated Lexington County Airport to be owned and operated by the county. After Pearl Harbor, the U.S. Army Air Force took control. Flyers known as the “Doolittle Raiders” arrived in February 1942 to train for their daring attack on Japan two months later. The base’s main role was to train newly commissioned pilots, bombardiers, and navigators in flying B-25 bombers. "C" is for Columbia, burning of (February 17-18, 1865). Columbia was in chaos when Mayor Thomas J. Goodwyn surrendered the city. Retreating Confederates set fire to the Charlotte Railroad depot. Cotton from broken bales was driven by strong winds all over the city. Locals offered wine and whiskey to Union troops. Throughout the day fires broke out in at least six locations downtown. Nourished by wooden buildings and a strong wind, the fire spread rapidly. As the fire spread, some Union soldiers engaged in frightful misconduct. "C" is for Coker's Pedigreed Seed Company. Coker's Pedigreed Seed Company had its origins in the efforts of David R. Coker to develop and market a highly productive variety of upland cotton.. The focus was on cotton, but Coker expanded the project to include corn, oats, rye, peas, sorghum, and eventually tobacco. Originally managed as a division of J.L. Coker and Company, the Pedigreed Seed Company was incorporated in 1918 as a separate business with headquarters in Hartsville. "B" is for Brown, Morris (1770-1849). In the early nineteenth century, Brown, a free mulatto of Charleston, received a license to preach and organize a congregation of black Methodists. When white Methodists reduced the influence that black Methodists had over church affairs, Brown and hundreds of black Methodists withdrew from the denomination in 1817 and formed a new African congregation in Charleston. Brown traveled to Philadelphia where he was admitted as an elder in the African American Episcopal Church. "B" is for Brown Fellowship Society. Established in 1790 by free persons of color in Charleston, the Brown Fellowship Society is one of the earliest institutions founded by African Americans in South Carolina. It was one of the myriad organizations that gave structure to the free black community and functioned primarily as a mutual aid association. It operated its own cemetery, provided assistance for needy survivors of members, and established a school. Membership was originally limited to fifty men drawn from Charleston’s free mulatto elite and their descendants. "B" is for Brown, William Melvin, Jr. (1934-1994). Manufacturer. A native Charlestonian and a graduate of South Carolina State, Brown served in the Army, taught in the Charleston County schools, and was the first black insurance consultant in Charleston. In 1972 he created American Development Corporation (ADCOR), the first minority-owned manufacturing plant in the southeast. By the early 1990s ADCOR was realizing revenues of more than $30 million annually and had 350 employees. "H" is for Hyer, Helen von Kolonitz (1896-1983). Poet, writer. While still in her teens, Hyer published her first poems. She joined the Poetry Society in 1920. Her first poetry collection, Santee Songs was published in 1923—followed by Wine Dark Sea in 1935. Frequent topics of Hyer’s verse included Confederate heroes, South Carolina history, and southern romance. Her more serious compositions were balanced with playful poems. "H" is for Hutty, Alfred Heber (1877-1954). Artist. A native of Michigan, Hutty attended the Art Student League in Woodstock, New York. In 1919, in pursuit of a warmer place to spend winters, he discovered Charleston—and for decades divided his time between Charleston and Woodstock. In 1923 he became one of the founders of Charleston’s Etchers’ Club. Hutty’s oil painting of Charleston streetscapes and lowcountry gardens are impressionistic. However, he earned greater fame for his etchings and drypoints. "H" is for Hurricanes. The term “hurricane” comes from the West Indian word “hurrican,” which means “big wind.” Hurricanes are classified into five categories using the Saffir-Simpson scale based on maximum sustained winds, minimal central pressure, storm surge, and damage. Since 1900, fifteen hurricanes have hit South Carolina directly, but only three have reached major hurricane status. In 1954 Hazel moved inland near Little River with winds of 130 mph and a seventeen-foot storm surge. Five years later Gracie hit Beaufort with 125 mph winds. "H" is for Hunting. Hunting has long been an important component of the Palmetto State’s culture. Indians hunted a wide assortment of game for food from as early as 13,000 B.C.E. Colonists also depended upon game for food. By the time of the Revolution, Carolinians recognized the detrimental effects of unrestricted hunting and enacted laws to restrict night hunting and to establish seasons for different game animals. In the 1920s wealthy northerners purchased lowcountry plantations as game preserves. Locals—white and black—created formal and informal hunting clubs. "H" is for Hunter-Gault, Charlayne (b. 1942). Journalist, civil rights activist. Hunter-Gault attended Wayne State University in Detroit before a judge allowed her to desegregate the University of Georgia. After graduating in 1963, she was a reporter and news anchor for WRC-TV in Washington, D.C. For five years she was the “Talk of the Town” reporter for the New Yorker magazine. "H" is for Hunter, John (d. 1802). Congressman, U.S. senator. Little is known about Hunter’s early life. He owned considerable real estate in Pendleton District. In 1785 he was elected to the General Assembly from Little River District (modern Laurens County). He represented the district at the 1788 convention to ratify the U.S. Constitution and at the 1790 South Carolina Constitutional Convention. In 1793 the voters of Ninety-Six District elected him to the U.S. Congress. Subsequently, the General Assembly elected him in 1797 to fill the unexpired term of U.S. senator Pierce Butler. "H" is for Hunter, Jane Edna Iris (1882-1971). Nurse, social worker. Family circumstances forced Hunter to go into domestic service when barely in her teens. She was able to work her way through Ferguson Academy (now Ferguson-William College) and graduated in 1900. She was admitted to the Cannon Street Hospital and Training School for Nurses in 1902. Her experience in the Charleston slums imbued Hunter with a powerful desire to help her fellow blacks escape such deplorable conditions. "H" is for Humphreys, Josephine (b. 1945). Novelist. Born in Charleston, Humphreys graduated from Duke and obtained an M.F.A. from Yale. In 1970 she began teaching at Baptist College in Charleston [now Charleston Southern University]. Drawing praise for its finely honed language and strong characters, her first novel, Dreams of Sleep (1984) won the Ernest Hemingway Prize for a first book of fiction. Humphreys’ second novel, Rich in Love (1987) was later made into a film. Fireman’s Fair (1991), her third novel, takes place following a destructive hurricane. "C" is for Columbia (Richland County; 2010 population 130,493). Named for Christopher Columbus and created in 1786 as the nation’s first truly planned capital city, Columbia has a unique history. While now the setting for state, county, and municipal governments, it took shape in the wilderness near the geographic center of South Carolina. The original plan for the city was a grid two miles square containing 400 blocks. Most exceptional were the wide streets. In 1950, Columbia embraced the city-manager government. "C" is for Colonoware. On historic-period sites in South Carolina, archaeologists often find locally made, hand-built unglazed pottery that was fired in open hearths rather than kilns. Vessels and sherds of this ware may be found on the sites of Indian camps and villages, the city lots of Charleston and other towns, underwater near wharves and ferries, and on small farms and plantations. This broad class of pottery has been termed colonoware. This pottery is most closely associated with Native Americans and African Americans, but associations vary considerably. "C" is for Colonial Agents. South Carolina, like Britain’s other American colonies, had no elected representatives in Parliament to argue for its interests. The problem for the colony then was how to get Parliament to pay attention to its particular concerns. Parliament, too, desired an informed source on its distant settlement. The answer--beginning in 1712--was a permanent colonial agent, paid for by the colony’s Commons House of Assembly. He reported regularly to the Commons House on matters of interest to the colony. "C" is for Colleton County (1,056 square miles; 2010 population 38, 909). Colleton County was one of three original counties organized in Carolina in 1682. Lying south and west of Charleston between the Combahee and Stono Rivers this Colleton was somewhat larger than its modern counterpart. By the 1730s the county had been subdivided into three colonial parishes. The General Assembly created Colleton District in 1800 with Jacksonborough as the courthouse town. In 1817 Walterboro became the county seat. "C" is for Colleton, Sir John (1608-1666). Proprietor. Colleton was a soldier and courtier of King Charles I and spent more than, £40,000 of his own money to support the king during the English Civil War. Following the king’s trial and execution, Colleton and his family fled to the protection of relatives in Barbados. He returned to England in 1659 where he joined others in returning Charles II to the throne. For his loyalty and service, Colleton was knighted in 1661. "C" is for Colleton, James (d. 1706). Governor. Colleton was the son and brother of Carolina proprietors. He was named governor in 1686 with instructions to clamp down on illegal trade with pirates. Because of political turmoil, he declared martial law—an unpopular move. Colleton was politically naïve and was tricked by the powerful Goose Creek Men into asking the colonial parliament to raise taxes on imported liquors to provide funds to increase his salary. His alleged allies turned on him; voted down the bill; and denounced his avarice. "C" is for College of Charleston. Although plans for a college at Charleston had been discussed throughout the eighteenth century, it was not until 1785 that the legislature authorized the creation of a college “in or near the city of Charleston.” In 1837 it became the first publicly funded city college in the country. Support was meager and enrollment declined. President Harrison Randolph’s long tenure (1897-1941) effectively established a new college. Money was raised and dormitories constructed.